Product prices and availability are accurate as of 2019-04-19 15:57:06 EDT and are subject to change. Any price and availability information displayed on http://www.amazon.com/ at the time of purchase will apply to the purchase of this product. 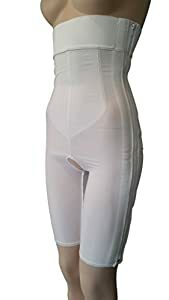 Featuring an extra high waistline for support after thighplasty, abdominal or side flank surgery and liposuction procedures involving the waist, hip and thighs. Our above-the-knee compression pants help to minimize swelling and reduce fluid build-up, promote skin retraction and body contouring.